I have been here nearly 3 weeks at my house outside of Poalo, a small village about 12 minutes by taxi from Latacunga. 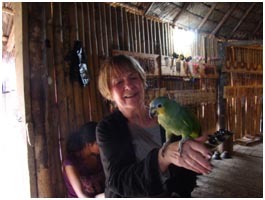 I have already been to Quito several times as well as to Banos and my first introduction to the Amazon (nice parrot!) by way of a day excursion to an indigenous community south of Puyo. So I have not been stuck but doing lots as I start to make the house functional, work on obtaining my residencia and have a bit of a holiday. So what are some of my first impressions or items that strike me as different? Well, I guess I could start with around my home. First off, for being a place in the countryside, it is not all that quiet. Ecuadorians seem to like to use vehicles with loud speakers to announce upcoming events or maybe support a political candidate. I have not yet got my Spanish to point where I can understand. Then there are the dogs. Everyone in the country has dogs, and note I said plural. On face value to guard their properties, so few seem to think they should be friendly dogs. Whenever anyone drives past a place or enters your lane or the neighbour’s, they bark. And people here seem to love to party loudly, with all sorts of music coming your way at high volume until at least 2 a.m. or later. Of course, being Christmas and New Year’s recently was a great excuse for parties. But then there are the birds and those I really like. All day various bird song. I don’t yet have a book on Ecuadorian birds, but just seeing a few fly by, I can tell that there are lots of doves, both versions of red and yellow tanagers and even sweet tiny green hummingbirds. As I get more floral plantings done here I am sure that many more birds will appear. 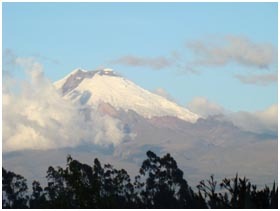 I live in Cotopaxi which has a very famous high volcano as its namesake. On a clear day, you can see it from my place. This particular part of the province of Cotopaxi is very dry, almost desert. Since I have been here there have been 3 tiny sprinkles, maybe for only an hour. I gather that real rains are supposed to come more so into February plus. Most farmers here, and the house is surrounded by farms, grow alfalfa which has a very deeply rooted system and once germinated can persist for years in fairly dry conditions. Nearly all the animals such as the dairy cows nearby graze directly or are fed hand-cut alfalfa. Rarely are animals allowed to just wander a field, as not everyone has fences. This approach maximizes the field’s produce. So almost every animal wears a collar or tie that has a rope attached to a peg in the ground. Regularly the animals are moved. Most fascinating is to see that almost all the large green verges that accompany roads and even major highways will have cattle or even llamas pegged out to both to utilize the feed and to maintain the verge. Nowhere have I seen large mechanical grass mowers! People, so far, seem genuinely friendly. Of course, I am the odd person out, but I do try small talk and sometimes well enough that the cab driver babbles on so fast I am lost. Day by day I learn a tiny bit more Spanish and Isabel my housekeeper, tries to ensure I get a few words right. But being thrust into the midst does call for more trying and I do. I have as yet to organize classes but have been quite busy just making things happen here. That will come in time. Some friends have thought Christmas would be exciting and very different here, but not quite what I expected. I live in a mainly indigenous area and while people may say they are Catholics, they certainly don’t practise much. I asked about happenings in Poalo and got sort of a blank response. For Isabel’s family, no going to a special church service or parades or anything feeling unique. So I gave them a very small party with cold drinks and cookies and Thermohair socks to each, then arranged to go to a tourist town, Banos, for 4 days over Christmas and that was a good decision. Heavy physical lab our can be still quite real here. I have had my first wire dog fence put in and that was serious work. Then I found one of my neighbours, a fairly elderly woman, gathering Eucalyptus leaves inside the front of my place. 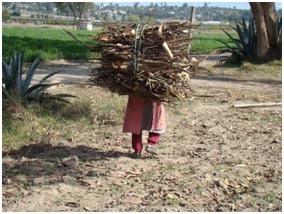 When she gathered them up with a rope and bundled them on her back, I found from my help to her that these were very heavy. She toted them home, back bent way over! Drivers are reasonably good with only a few questionable infractions such as regularly changing lanes to get the best racing line on a road. Saying inside your lane is sort of a novelty. But absolutely nothing like India! I was fascinated by Ambato as I went through on the bus, to see a whole street devoted to selling jeans, saying "made in town”. And, oh, so tight, maybe stretch because while tight clothes can be favoured, not all ar e slim. 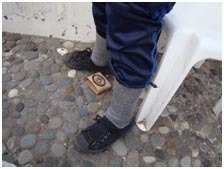 In fact, many communities have single streets devoted to one item such as auto parts, making furniture, creating cement blocks. So these are some of my first impressions. Later I’ll chat about living here and places I go.